Over the past two decades, Warner Bros. Pictures have struggled to produce critically acclaimed blockbuster hits based on DC Comics characters, with the exception of Watchmen and The Dark Knight. With Marvel Studios upping the ante to deliver box office smash hits, the bar was set high for superhero films. Not only is competing with Marvel to produce a large scale superhero team film a challenge, but attempting to deliver a solo female superhero film, particularly that of a major DC Comics heroine, which, in the past, has failed to take off, was incredibly risky. However, with Patty Jenkins and Zack Snyder at the helm, the first ever silver screen iteration of Wonder Woman defied all odds and proved to be a standout film, breathing new life into the DC Entertainment Universe and is worthy of not only fan approval and critical praise but also one of the highest ratings on the notable film review website, Rotten Tomatoes. The character of Wonder Woman has always been a difficult character to adapt on to screen. Though the 1970s TV series starring Lynda Carter and the 2009 animated feature film were entertaining and represented a fair depiction of Diana, Princess of Themyscira, no other attempts managed to truly portray the true depth of the Amazonian warrior. The newly released Wonder Woman, starring Gal Gadot, Chris Pine, Robin Wright, Danny Huston and Connie Nielsen, however, manages to capture the true essence of the DC Comics character with a refreshing origins story of the ages. The film takes us through Diana’s story, from the sheltered princess she once was, living on the island paradise of Themyscira, to the Amazonian warrior she becomes, determined to rid the world of war and hate. The origins story is brilliantly told as we are given a look into the world of the Gods, the creation of mankind and their eventual downfall. Engrossed by the history of the world and the reason for all the hate, we watch as Diana (Gal Gadot) trains to become worthy of wielding the ultimate weapon to battle the God of War himself, Ares (David Thewlis). 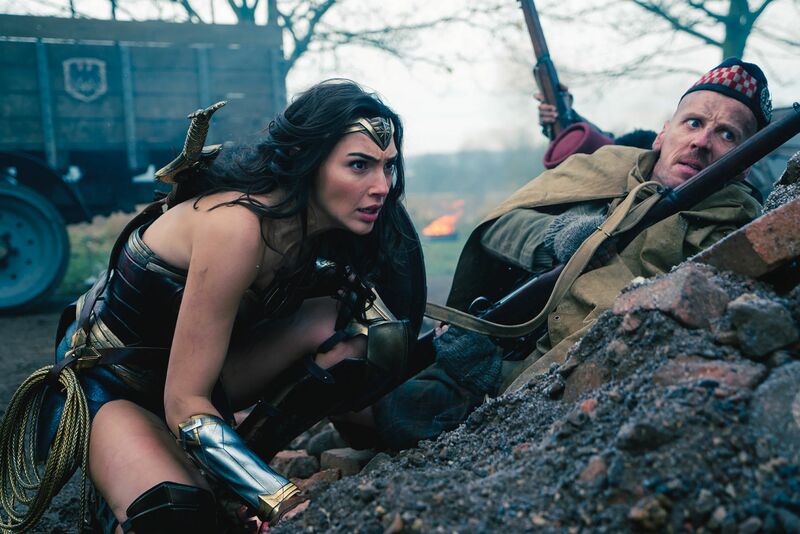 Her chance meeting with Captain Steve Trevor (Chris Pine) sets her on her path toward fighting alongside the British in the war to end all wars, World War 1, which leads to her rise into the ultimate goddess of justice. Gal Gadot’s performance as Diana is beyond anything I have ever seen in a live-action depiction of a female superhero. Despite numerous other live-action depictions of female superheroes over the years, Gadot’s Wonder Woman shines above and beyond, portraying the DC hero as strong and courageous, with godlike abilities but who’s also young, naive and at the end of the day, a woman with emotions. As the film depicts an origins story, it is not expected for Wonder Woman to be the incredibly talented and all powerful member of the DC Trinity that many of us have now come to see her as. Instead, it is refreshing to watch her fumble and struggle to become accustomed to the world of man, allowing her very ‘human’ emotions to, at times, get the better of her. Along with Gadot’s charisma and charm, this version of Diana is extremely likeable. This is the Wonder Woman as we have never seen and it is glorious. Gadot was not the only one who performed fantastically in the film. Each of the actors played their roles fantastically, bringing to life characters crucial to Diana’s transformation. My personal favourite, next to Diana, is that of General Antiope (Robin Wright) who embodied the very definition of Amazonian warrior with her magnificent prowess in battle. In fact, my favourite scenes of the film are the various training and battle scenes on Themyscira. Not only were the Amazons skilled warriors with beautifully choreographed combat moves, but they looked absolutely stunning as well, enhanced by their incredibly detailed armour. Speaking of stunning, the island of Themyscira was absolutely breathtaking. The visuals of this film surpasses that of any other DC Comics film I’ve seen, with an almost realistic look at war in the 20th Century. The visual graphics of the film certainly provided Diana with ethereal weapons and powers which appeared almost magical. The Lasso of Truth was incredible to watch in action, as are the powers of both Diana and Ares. The final battle between the Amazonian princess and the God of War is a visual masterpiece, which along with an epic soundtrack, is one of the most exhilarating battle scenes in a superhero film. Almost every aspect of the film, from the story down to the little bursts of humour and wit, were incredible. Even though many insignificant aspects of Diana’s background and parentage was altered in the film, this did not affect the quality of the film or its narrative. Unlike other DC Comics films, there was not much about Wonder Woman that I did not enjoy or appreciate, except perhaps, the romantic scenes with Steve Trevor, which seemed unnecessary as in the comics, despite being a love interest, Trevor and Diana’s relationship never went further than just good friends. Wonder Woman is an exhilarating, thrilling, visually gorgeous and fantastically made film bringing about new life into the tired DC Comics superhero film franchise. With such a brilliant portrayal of one of the world’s most popular female superheroes, Wonder Woman paves the way for gender equality in the superhero film genre and shows us just how it’s done when making a solo female superhero film. With likeable characters, brilliant visuals and a story which leads into the creation of the world’s greatest superhero team, The Justice League, Wonder Woman is a breakthrough and stand-out film that deserves to be watched more than once. Joss Whedon To Direct Standalone Batgirl Film For Warner Bros.